FORSYTH, JOSEPH, merchant and office holder; b. c. 1760 in Huntly, Scotland, son of William Forsyth and Jean Phyn; m. first c. 1797 Ann Bell in Kingston, Upper Canada, and they had one son; m. there secondly c. 1803 Alice Robins, and they had six children, including James Bell Forsyth*; d. there 20 Sept. 1813. Exactly when Joseph Forsyth came to British North America is not known. 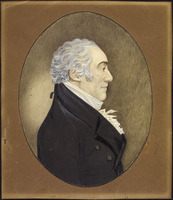 On 24 Nov. 1784, with his brothers John* and Thomas, he signed a petition urging repeal of the Quebec Act [see George Allsopp], and most accounts place his arrival in that year; in a memorial of 31 Jan. 1795, however, he claimed residence in Upper Canada of “Fifteen years and upwards.” Nor are his whereabouts in the early years entirely clear. In 1786 he was described in a lawsuit at Montreal, Que., as a resident of Detroit (Mich.), and the following year his name was among those supporting the Church of England clergyman there. But by 31 May 1789 he had settled in Kingston, and his prominence dates from his association with that town. Tied by kinship to a powerful mercantile network, Forsyth was now advantageously situated to avail himself of the opportunities afforded by local retailing, the supply of garrisons, and the forwarding trade between Montreal, Kingston, the Niagara area, and Detroit. Although in July 1789 Forsyth described his activities as being “partly with a view to supplying Loyalists who have authorised our Friends Messrs Phyn Ellice & Inglis of London to receive Compensation allowed them by the British Governm’t,” it appears his major concern until 1793 was supplying the garrisons. He acquired exclusive rights to the government wharf where he erected a large storehouse. Such were the improvements made to the property that when the commissariat repossessed it after his death, they paid £2,836 in compensation. Since 1786 the policy of the army had been to provision the upper posts with the produce of farmers in the surrounding areas. But problems such as distance of farms from the garrisons, the inability of local areas to produce surpluses, the want of a circulating medium of exchange, and the peculiarities of payment combined to enable a handful of merchants to control the lucrative trade. Forsyth’s share of this market seems to have been substantial. Until 1795 Kingston merchants supplied Detroit because of that area’s lack of wheat surpluses. Moreover, a crop failure at Niagara in 1789 gave the Kingstonians a monopoly there for a two-year period. Anticipating that this windfall would be repeated in 1792 Forsyth and several others, including Richard Cartwright, Robert Macaulay*, and Thomas Markland*, bought almost 4,000 barrels of flour. But a bumper crop at Niagara reduced their market to 500 barrels at Kingston; export to Lower Canada could be undertaken only at a substantial loss. 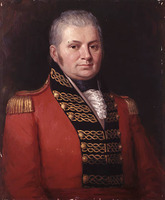 Dependent “chiefly” upon flour for their remittances, the merchants petitioned Lieutenant Governor Simcoe to purchase their surplus for government stores. However, Commissary General John Craigie saw no reason to indemnify them. The collapse of the Niagara market in 1792, combined with the award to rival merchants the following year of a two-year contract to supply the garrisons, seems to have pushed Forsyth’s enterprises in new directions. 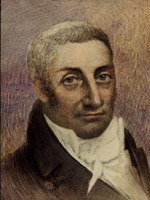 In late 1793 he approached the Schenectady, N.Y., merchant John Porteous about the possibility of a market there for the “pretty abundant” wheat at Kingston but without any success. The next year he invested in John Denison’s brewery at Kingston and leased him the lands and necessary buildings for £125 for one year. Later, Forsyth called in his share of the investment; Denison was unable to pay and Forsyth assumed control. By 1802 the brewery was in an “advanced state of decay.” His new partner in the business, Alexander Wood* of York (Toronto), wanted to retain the property but Forsyth was anxious to sell it to James Robins, his future father-in-law, for £1,000 plus interest. Forsyth had petitioned successfully in 1793 for a town lot in York, but he does not appear to have been concerned with land as a speculation until 1795. Early that year he enquired on behalf of three relatives – his uncle Alexander Ellice, his cousin John Richardson*, and his brother John – about the conditions attached to township grants in Upper Canada [see Richard Duncan]. Later that year Forsyth and his brothers each petitioned for grants of 1,200 acres and by late November 1799 he had received patents for lots in Clarke, Cramahe, Haldimand, Percy, Scarborough, and Thurlow townships. He also acquired land by purchase and in lieu of cash payments for goods, and further increased his holdings as a result of lawsuits against debtors. On such occasions, it was not unusual for him to seek advice from the surveyor general about the quality and value of the lots in question. It is probable that Forsyth regarded land as a long-term investment and retained most of his holdings at his death. About 1795 Forsyth began to act as a Kingston agent, first for Receiver General Peter Russell and by 1797 for Surveyor General David William Smith*, issuing supplies and notes. He seems to have continued to operate in this capacity until 1800, and again in 1803–4. These contacts brought additional benefits and he became a personal forwarder, receiver, and supplier for other York officials, such as John McGill* and Robert Isaac Dey Gray. In 1797 Forsyth’s name reappears on the victualling accounts of the commissariat. That year he supplied the garrison at Kingston with 67,200 pounds of flour and 550 barrels of peas. The volume of this business declined to 23,744 pounds of flour and 41 bushels of peas the following year, remained steady in 1799, and dropped to a mere 200 bushels of peas in 1800. It was three years before he again supplied the garrison – a modest 220 bushels of peas. In 1804 he delivered 80 barrels of pork and 19,000 pounds of flour. After that date pork became the major article of supply: 16,640 pounds in 1805, 4,000 pounds in 1807, and 25,000 pounds in 1808 and 1809. Once again trade with the garrison declined and the last record of business is an account for 500 bushels of peas in 1811. The garrison was an unstable albeit profitable market. In 1800 Upper Canadian merchants began for the first time to export wheat and flour to Lower Canada; Forsyth shipped 400 barrels of flour, 5 of potash, and 80 bushels of wheat. The following year the increase in his trade was dramatic. From the Kingston area he shipped 803 barrels of flour to Montreal in partnership with Robins, and 250 barrels for another merchant; with Robins he shipped from Niagara 298 barrels of flour and from Detroit 1,103, as well as 6 barrels of potash. An annual account circa 1802, presumably for the Kingston area alone, indicates how quickly he had adjusted to the demands of the new market. That year he shipped 1,739 barrels of flour, 25 barrels of potash, 20 barrels of pork, and 563 pounds of butter to Montreal. Forsyth’s was one of a handful of shops maintained by the leading Kingston merchants and local retailing continued to be a major part of his enterprises. 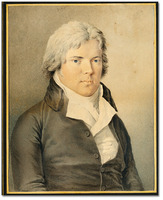 He sold a wide variety of goods, and his imports at Coteau-du-Lac in 1801 included large amounts of many luxury items. Extension of credit was necessary for any merchant in a province lacking a circulating currency, and served to build and secure a fixed clientele. One notable development of this practice occurred during the War of 1812, when Forsyth banded together with other large merchants such as John Kirby* to form a rudimentary bank. The sole purpose of the short-lived Kingston Association, established on 28 Aug. 1813, was to issue bills in exchange for specie. AO, ms 88, Elizabeth Russell to Joseph Forsyth, 8 Aug. 1809; ms 392, 20–164 (Court of Common Pleas, Montreal District, court docs. ), no.3 (Hoyles & Small v. Joseph Forsyth, 13 June 1786); ms 522, William Jarvis to John Peters, 23 Nov. 1793; Joseph Forsyth & Co. to Peters, 6 Feb. 1796; ms 525, John Denison to Joseph Forsyth & Co., accounts, 10 April 1794, 2 Oct. 1795, 15 April 1796; Kingston Brewery to Forsyth & Co., account, 12 April 1794; indenture between Forsyth and Denison, 1 Oct. 1795; RG 1, A-I-6: 481–82, 1503–4, 1582–83, 1795, 1853, 1857, 1893, 1984–85, 2055, 2139, 2173, 2460, 2466–67, 3147–48, 3163, 3418, 3461, 3532, 3580, 3609; A-II-1, 1: 222, 386, 402; C-I-4, 40: 84; RG 22, ser.54, 1–2; ser.155, will of Joseph Forsyth. Buffalo and Erie County Hist. Soc. (Buffalo, N.Y.), C64-4 (Porteous papers), nos.41–43, 1272–78, 1280, 1282 (mfm. at PAC). Durham Land Registry Office (Whitby, Ont. ), Abstract index to deeds, Clarke Township, 2: 7–10 (mfm. at AO, GS 3852). MTL, Peter Russell papers, Joseph Forsyth to Russell, 14 Oct. 1795; 2 Nov. 1796; 2 Nov., 8 Dec. 1797; 15 April, 24 May, 2, 12 June, 13, 20 July, 3–4 Aug., 1 Sept., 12 Dec. 1798; 30 May 1800; 21 Aug. 1803; John Gray to Russell, 23 Dec. 1803; 18 Feb. 1804; Alexander Wood papers, business letterbooks, I–III. Northumberland East Land Registry Office (Colborne, Ont. ), Abstract indexes to deeds, Cramahe Township, l: 213–14; Percy Township, 1: 111 (mfm. at AO, GS 4727, 4792). PAC, RG 1, E3, 100: 206–11; L3, 185: F1/6, 28; 186: F4/11; 186a: F5/19; RG 8, I(C ser. ), 77: 34; 111: 156; 112: 34; 115A: 49, 62; 115B: 70, 92, 348; 115C: 3, 179, 244; 115D: 1; 115E: 53–54, 66, 187, 246, 271–72, 302; 115F: 101, 203–4, 220–21, 256; 272: 191; 505: 156; 688E: 89, 136, 138; 724: 113; 913: 53, 57; 930: 63; RG 16, A1, 133, unsigned draft memo, 14 June 1813; RG 68, General index, 1651–1841: f.419. PRO, CO 42/317: ff.186–89, 191, 193–94, 197–205. QUA, Richard Cartwright papers, letterbook (transcript at AO). “Accounts of receiver-general of U.C.,” AO Report, 1914: 739–40, 742–45, 752, 774. Corr. of Lieut. Governor Simcoe (Cruikshank), 2: 217. “District of Luneburg: Court of Common Pleas,” AO Report, 1917: 438, 445. “District of Mecklenburg (Kingston): Court of Common Pleas,” AO Report, 1917: 202, 213, 241, 250–51, 275, 346. Docs. relating to constitutional hist., 1759–91 (Shortt and Doughty; 1907), 502–9. Docs. relating to NWC (Wallace), 442–43. “Grants of crown lands in U. C.,” AO Report, 1929: 53, 129. John Askin papers (Quaife), 1: 303, 367. Kingston before War of 1812 (Preston), 109–10, 145–46, 189–90, 202, 280a-b, 296. Parish reg. of Kingston (Young), 25, 32, 57, 65–67, 69, 72, 91, 94, 110, 112, 129, 137, 151, 158. [John Richardson], “The John Richardson letters,” ed. E. [A.] Cruikshank, OH, 6 (1905): 24. “U.C. land book D,” AO Report, 1931: 123. Kingston Gazette, 31 Aug., 23 Sept. 1813. Montreal Herald, 2 Oct. 1813. Heritage Kingston, ed. J. D. Stewart and I. E. Wilson (Kingston, Ont., 1973), 37. MacDonald, “Hon. Richard Cartwright,” Three hist. theses, 127. Wilson, “Enterprises of Robert Hamilton,” 62, 64, 111. W. S. Wallace, “Forsyth, Richardson and Company in the fur trade,” RSC Trans., 3rd ser., 34 (1940), sect.ii: 187–94. 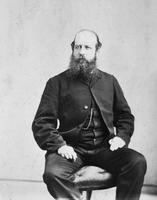 David S. Macmillan, “FORSYTH, JOSEPH,” in Dictionary of Canadian Biography, vol. 5, University of Toronto/Université Laval, 2003–, accessed April 24, 2019, http://www.biographi.ca/en/bio/forsyth_joseph_5E.html.